Genesis Zool: Ninja of the "Nth" Dimension (USA) in 19:00.13 by Ploplo. Zool: Ninja of the "Nth" Dimension is a fast-paced side-scrolling platformer. The protagonist can run, jump, climb walls, and shoot enemies. 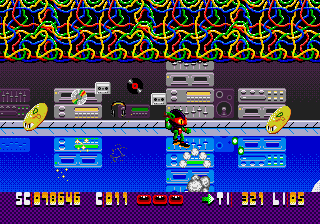 Power-ups for Zool are scattered across the levels. These include life-spending hearts, smart bombs, shields, more powerful jump-skills and a twin Zool. This "twin" imitates the original's motions a few seconds after he performs them. Ploplo completes the game in record time.